Seagrove Beach derived its name from the thick grove of Oak trees that flourish along this Gulf of Mexico beach. Erin Oden and Coastal Luxury specialize in the listing and sales of Seagrove Beach real estate. Seagrove Beach is among the earliest settlements along what is now Scenic Highway 30A. It is situated approximately 17 miles east of Destin and 16 miles west of Panama City Beach in Northwest Florida. 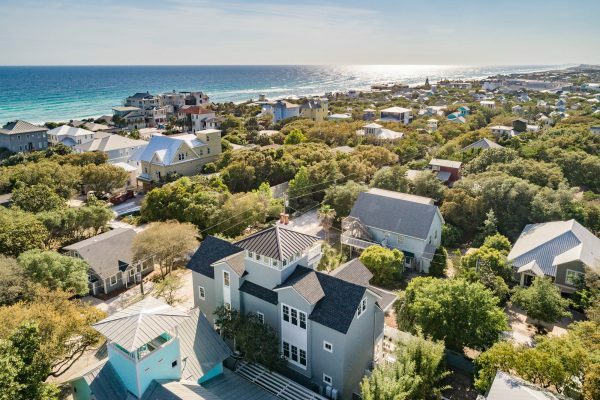 Seagrove Beach offers single -family homes, home sites, town homes and condominium projects built on Scenic Highway 30A. Seagrove Beach is not defined by any particular architectural style. Modern interpretations of original concrete-block Florida beach cottages stand among their original counterparts. Gated communities such as Jasmine Dunes have a Greek-Revival inspiration, while Palmeira Villas favor a more Mediterranean flare. Seagrove Beach also includes two of the three high-rise towers built before the four-story height restriction, namely One Seagrove Place and BeachCrest. One Seagrove Place offers some of the least expensive beachfront residential opportunities along 30A. Seagrove Beach is a colorful community with many unique boutique shops and fun casual eateries. The area also features some of the finest dining on 30A, like the popular Café Thirty-A and The Fish House Restaurant.